Address: 1081 Budapest, Népszínház u. 39-41. The hotel has 136 rooms. 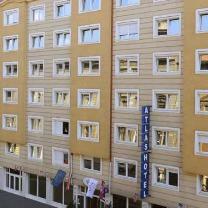 Atlas City Hotel is located in the Budapest center, with spacious, well-equipped rooms hotel provides full range of three-star accommodation services for individuals, families or groups. Atlas City Hotel is located in the centre of Budapest, near Blaha Lujza square so the hotel is easily accessible around the clock. To reach Blaha Lujza square take either the tram 4 or 6 or the red metro (M2). Then turn left onto Nepszinhaz utca at the Mc Donald"s and Atlas lies within 5 minutes walk (400 metres) or one tram stop away on the right side of the street. Hotel Atlas offers different room types to suit your needs (single, double, triple and four bedded), whether travelling with colleagues on business or with family or friends on holiday. All rooms have en-suite bathroom, telephone, colour TV with satellite channels, minibar and adjustable air-conditioning. A few special jacuzzi rooms also offer a touch of luxury. Buffet breakfast included in the price, 24 hours reception and bar, free wifi in the lobby, secure parking for extra charge, luggage room and safe facilities for free, organizing of cultural programmes and excursions, conference room, half board available for groups if ordered in advance.